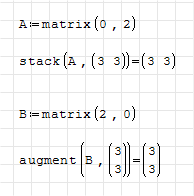 There are few ways to insert matrix (matrices). From the menu: Insert=>Matrix, keybord shortcut CTRL+M, from the Matrices palette (Matrix 3x3), inserting the function mat(. You will get the 3x3 template, or the dialog box to insert the number of rows and columns. Let as assign to a variable name A, matrix with dimensions 3(rows)x3(columns). For instance, press: A: and then CTRL+M. 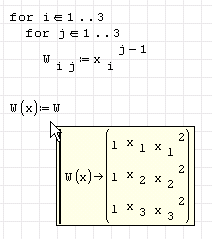 The matrix template with 3x3 empty place holders will appear. 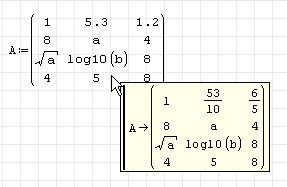 Now, you can insert single integer (vector) or two integers (matrix) to asign vector or matrix elements. 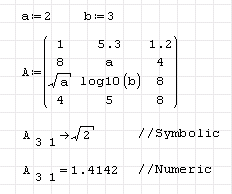 Here (matrix) press 3,1→ or 3,1= . The value of A in the third row and first column will appear (the minimal row and column index is 1). 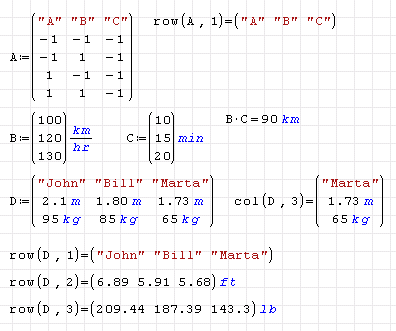 It should be noted that elements of a matrix could be of different data type (numeric, text, units). Here are few simple examples demonstrating this feature. Note the using of function row and col to extract a single row or single column. 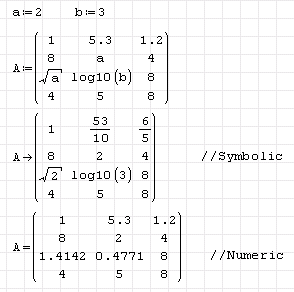 SMath also supports nested matrices, i.e. the matrix element could also be a matrix. See the next example. The individual elements are presented in the same way as before. 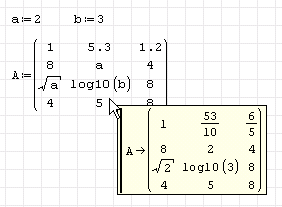 Matrices in SMath are dynamic arrays and they can change their dimensions. For instance matrix function gives a matrix filled with zeros. See how you can do the same by assigning the zero value to the element z3 4. Besides the matrix/vector variables, there are also matrix/vector functions. Function f have a single argument and it returns a three element vector. The argument can be scalar,vector or matrix. Try it. 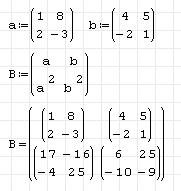 Function ff expects two element vector, and function F expects two arguments and returns 2x2 matrix. Play with them. You can initialize an empty matrix with a fixed dimension using the matrix(rows,cols) and setting one of the two arguments to 0.